1958 Ocala Horse Farms Map Courtesy of FTBOA. The Ocala and Marion County area is home to an exciting variety of horse breeds including Thoroughbreds, Paso Finos, Missouri Foxtrotters, Arabians, Morgans, Quarter Horses, and many more. Marion County also supports a thriving cattle industry, as well as bountiful peanut and hay farms. Ocala earns its titles of “horse country” and “horse capital of the world” with its favorable climate, mineral-rich soils, and rolling pastures that create an ideal agricultural environment. The dense concentration of Thoroughbred breeders and trainers in the area is well-supported by a network of equine services that includes world-class veterinary hospitals, feed and tack retailers, blacksmiths, equine dentists, and major horse transportation companies. We are proud of Marion County’s contribution to the world of equine sport: our farms and training centers have produced 50 National Champions, six Kentucky Derby winners, seven Preakness Stakes winners, six Belmont Stakes winners, 26 Breeders’ Cup champions and six Horses of the Year. Ranked second in the nation for foal production, 75 percent of Florida’s Thoroughbred industry is located within Marion County. Ocala is also home to Ocala Breeders’ Sales Company, which holds major bloodstock auctions throughout the year. The Florida Thoroughbred Breeders’ and Owners’ Association is also located in Ocala, and its main focus is supporting and promoting the Florida Thoroughbred industry. The FTBOA administers the $15 million state breeders’ incentive as well as awards programs for Florida-bred racehorses. 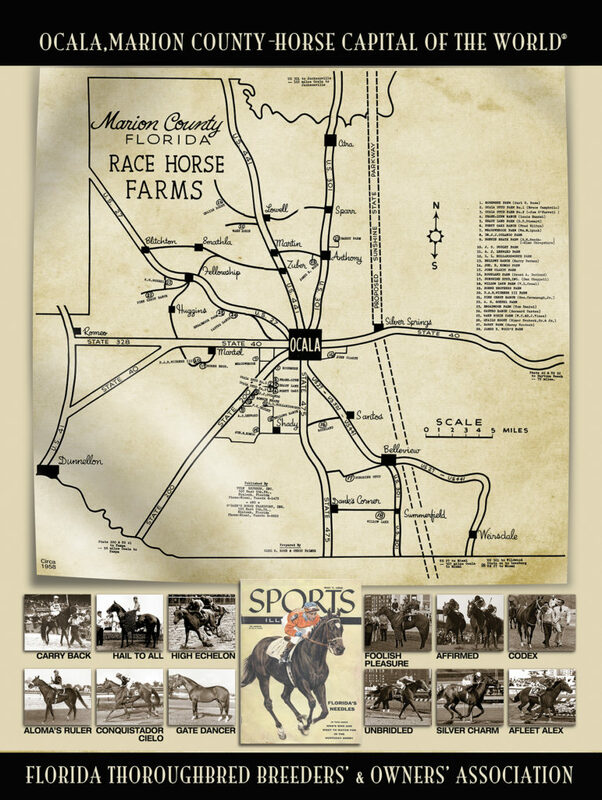 The first Thoroughbred farm in Marion County, Florida was founded in 1936 by Carl G. Rose, who had traveled from Indiana to oversee asphalt road construction in North Central Florida. Impressed by the area’s beautiful rolling hills, abundant limestone, and a year-round moderate climate, he realized Marion County would be the perfect location for training strong, healthy horses. Rose quickly bought a great deal of Ocala land at $10 per acre, and his new Rosemere Farm along State Road 200 became home to Gornil, the first Florida-raised Thoroughbred to win a Florida race. Oil man Bonnie Heath soon set up his own eponymous and historic farm which produced Needles, the state’s first Kentucky Derby winner. You’ll find prominent highways named after both Rose and Heath throughout Ocala, and Bonnie Heath Farm is still operated by the Heath family today. In 1956, the Ocala area Thoroughbred industry began its meteoric rise. After Needles won the Kentucky Derby, Marion County soon became a major Thoroughbred center of the world.